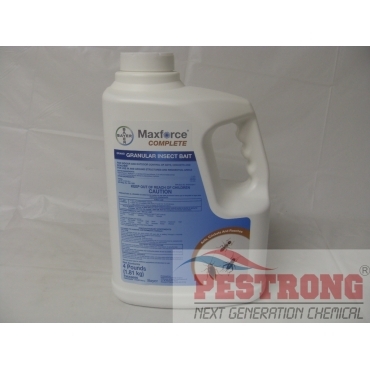 Where to Buy Maxforce Complete, Maxforce Complete Granular Insect Bait - 4 Lbs - $69.95 for Sale with Fast Free Shipping! Maxforce Complete Granular Insect Bait - 4 Lbs contains a special blend of foods, combined with the delayed-action stomach poison, hydramethylnon. The delayed action of the active ingredient allows foraging ants to bring the bait back to the nest so that the entire colony, including the queen, is destroyed. Maxforce Complete Brand Granular Insect Bait is a ready-to-use product for use indoors and outdoors and around buildings, on lawns,and other non-crop areas such as residential areas, the non-food/non-feed areas of institutional and commercial establishments including warehouses, restaurants, food processing plants, supermarkets, hospitals, nursing homes, motels, hotels, apartment buildings, schools, laboratories, computer facilities, pet shops, zoos, sewers, highway rights-of-way and medians, traffic islands, utility rights-of-way (including power lines, pipelines, aqueducts) managed turf areas (non-crop) (including school yards, playgrounds,athletic fields, amusement parks, picnic areas, recreation areas, office parks, industrial grounds, airports, shopping centers, public parks, arboretums, public gardens, monument sites, cemeteries and mausoleums, golf courses, race tracks, fairgrounds, outdoor amphitheaters, sod farms, and ornamental nurseries). 1. AROUND STRUCTURES: rate of 0.5 oz (one tablespoon) of bait per 25 linear feet. A typical application would be 4-8 oz adjacent to an average sized home of 200-400 linear feet. 2. REFILLABLE STATIONS: Place up to 1 to 3 oz (2 to 6 Tbsp.) of bait into tamper resistant stations and close securely after application.Use approximately 2 stations per side of a typical single family home. 3. BROADCAST APPLICATION: 1 oz per 1,800 sq ft (equivalent to 1.5 lbs/A). 4. FIRE ANTS AND OTHER MOUND BUILDING ANTS: two tablespoons (1 oz) of bait around each mound. 5. For INDOOR USE: Apply up to 0.5 oz (one tablespoon) of bait per crack, crevice or other inaccessible areas where insects may hide or live. we bought this granular, applied outside the house, and it has been amazing.the very next day, all the ants I saw were either dead or punch drunk. 5 days later not an ant to be seen. Great indoor and outdoor bait solution. Thanks.